These shawl closures are so attractive. Each one is hand carved and inlaid with a variety of exotic woods, shell, south sea abalone, and mother of pearl to provide an eye-catching accent to your favorite wrap. This design has actual measurements of approximately 4" wide by 1½" tall (11x 4cm). 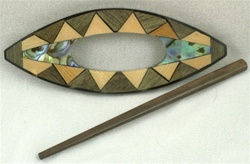 The stick pin is about 4¼" (11cm) long.